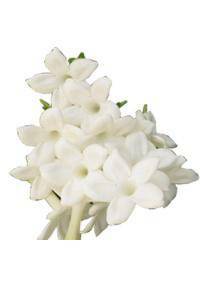 Stephanotis is a heavily scented flower that has a waxy appearance. It is an evergreen vine that will climb if it has a trellis or fence. It will also spread outward if it is able to instead of upward. Blooms are available from spring until fall under good conditions. Blooms often appear in clusters rather than more spread out on vines. Thick green leathery leaves give the flowers a deep visual contrast. Stephanotis floribuna is perhaps the best known of the entire species. The star shaped flowers are produced in pairs or small clusters. It is popular in containers as a climbing vine or with a trellis. The blooms can be obtained year round due to indoor cultivation. For this reason it is often grown indoors as a houseplant by many. If tended properly it can provide many years of fragrant blooms. S. japonica is native to Japan and produces similar shaped blooms. These may appear to be more fully star shaped and less clustered. The petals appear to be more spaced compared to some other species. Other species include the S. grandiflora and S. isaura varieties. These other species often produce the same bloom style and color. Variations may be produced due to cultivation for other locations. There are two primary options for adding these plants to gardens. The first is to allow them to grow outward as a spreading creeper. If tended, it can be used as a creeping ground cover that flowers. As a ground cover, it may still grow upward if it is able to do so. It may climb up fences, trees or walls if they are nearby to plants. This growth can be discouraged by cutting the plant back from objects. A trellis, fence or wall can often be used to encourage upward growth. Growth of 15 to 18 feet can be reached with healthy tended plants. This may include outward spread as well as upward creeping growth. Pruning must be done if the plant size is desired to be smaller. If left unchecked, these plants will often spread wildly in lawns. Plants may also be used for hanging baskets as they can droop down. Well drained soil is crucial to ensure long lasting plant life. These vines will often die quickly if they remain damp too long. Soil must be enriched to ensure it drains quickly and thoroughly. A drying period should be given between watering the soil around it. This is important for both garden and container grown varieties. In areas of frequent heavy rain, performance may be more limited. A partial sun location is often best for outdoor growing conditions. Too much direct sun can burn the leaves and limit the plant growth. During midday indirect light is often preferred to avoid leaf scorch. A steady temperature is also needed as sharp changes cause shock. Temperatures below 50F can cause early decay and halt seasonal growth. If grown indoors, cold locations should be avoided to prevent death. This flower has long been associated with marital bliss for couples also known to represent innocence and devotion.